nice one asker, your are doing better and better. more awesome theme are coming soon! The best yet. Thanks a lot. We designed the post part of the index to contain 9 posts. But in the latest posts when I check the site at Mozilla Firefox, I see that the youtube video I posted can be seen from the index. Pls send the screenshot URL and the URl of your blog to me. Your blog theme is looking fine for me. Anothr question: It says “updated” for the theme. I’m planning to download the updated version of this theme if you approve the updated version won’t have the problem of showing the latest post’s video in the main page. Could you confirm? Should I download and load the updated version? Please note that I may lose some of the html modifications i did in the blog. just backup your template and try uploading the updated version. hi, is there any possibility to change background from black to white? how can i add the date for the posts? it doesn’t appear.please help me!!! In IE8 does not work navmenu. 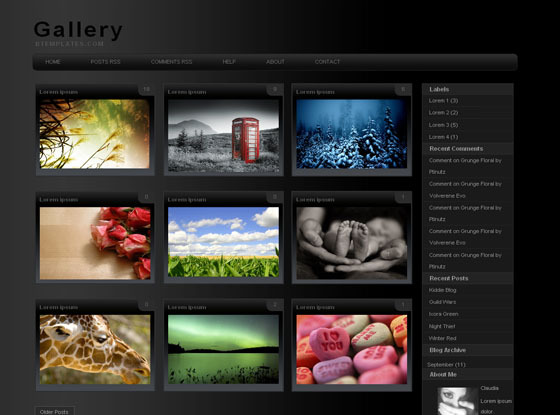 this theme is designed for photoalbum like blogs and longer post tiles make it truncated. How can you activate the links on the Page Bar? Great template but if the clicks on the home will go http://www.bloggerthemes.net. Overall I like it. I like it. I successfully used this template. Thank you very much bloggerthemes.net. sorry Dale the read more script has some problems in IE.I hope that soon this error will be fixed by somenone. I have problems when I post a video form youtube, the videoplayer appear on the main page, can you help me? en primer lugar cuando damos click a la imagen nos envia a la imagen en si, más no a la dirección del post. Luego si vamos a ver el post solamente, las imagenes de los marcadores sociales salen en desorden, y algunos otros errores en la página principal con los post que contienen texto. Todos estos problemas en Internet Explorer. @Alex sorry the script is not compatible with IE.It works fine on all other browsers. I want to ask you: how can I change the way it shows the thumbnails? some of my images are very distorted. How can I change the size of the thumbnail? How Can I choose a part of the image to be shown on the thumbnail? I love this theme, but it does originally not work with IE. I have done some fix with the compatibility to IE browser. you may like to see and try it!!! thanks for fixing the bugs.I will add the URL of this fix in this post. I love this template so much! Thanks for creating it. I am having the same issue where both in IE and in Firefox, clicking on the picture pulls up just the image and not the blog post. I am also wondering if there is a way to make the pictures compress properly with a percentage ratio? Something so that they won’t appear distorted and where I won’t have to resize each photo manually. if you cannot fix the problem with this tutorial.Leave a comment I will try to fix it. The template is super fantastic, but ‘portrait’ style images appear distorted when using the Mozilla Fiefox browser. Can this be fixed? Thank you. i have one. . . I applied this lovely template and a have a problem with Chrome and Firefox. Items at Navmenu like home , etc, can’t float left in Chrome and firefox. But, In IE that is Ok. Can you help me, please? I solve the problem by deleting all existing widgets and reload gallery template.